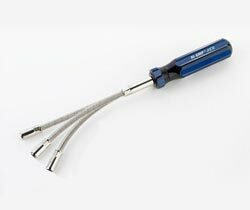 We, being an impeccable Supplier, Exporter and Importer of Hi Grip Flexible Screwdriver provides you an interchangeable system of handling, holders and blades designed to cover all hand applications of deburring. It is made up of HSS and carbide blades, countersinks and scrapers along with ergonomically designed handles. This is one of the most comprehensive ranges available. It ensures minimal vibration, giving an excellent finish on many man made materials such as plastic laminates.